Cal State Fullerton swim team, early 1970s. Hanauer on the ladder, near the bottom rung. Did you know that the grab start—the dive used today—was developed by a Southern California swim coach? Eric Hanauer, former coach of Newport Harbor High School and Cal State Fullerton, described how the grab start began. After leaving Chicago for graduate school at UCLA, Hanauer worked there as a volunteer assistant coach for swimming and water polo. His first job after UCLA was as a swimming and water polo coach at Newport Harbor High School. After that year, Hanauer was offered the job to start the swim program at Cal State Fullerton and he taught all the swimmers the grab start. Steve enrolled at UC Irvine with coach Ted Newland and showed his team the grab start there. “Cal State Fullerton dropped swimming in 1974,” Hanauer said. “A year prior, they moved from DII to DI because of football. Although we made the top 10 in Nationals twice in DII and had many All Americans, the budgets were cut in half for non-revenue producing sports, so Hanauer resigned. He had tenure in Kinesiology and began teaching Diving (scuba, not spring or platform). Hanauer with underwater camera gear, mid 1970s. Although Eric Hanauer made his first dives in Chicago’s lakes and quarries in 1959, he didn’t focus primarily on diving until 15 years later. In the meantime he was a successful swimming and water polo coach at Morgan Park High School (Chicago) and at California State University Fullerton. He developed the grab start, which is now used by swimmers worldwide. Hanauer founded the scuba program at Cal State Fullerton, and when he moved from coaching into teaching began shooting pictures underwater instead of shooting fish. He introduced thousands of students to the underwater world during his 35 years as an associate professor of physical education. In 1977, he broke into a new field with his first article in Skin Diver magazine. Over the past 30 years, his photos and articles have been published in magazines, books, posters, and CDs worldwide. He has written guidebooks to the Red Sea and Micronesia, as well as an oral history of diving in America (see Publications page). Currently Hanauer is primarily shooting underwater video, and his work as been selected for showing in festivals, on the internet, on iTunes, and in TV commercials. He is past president of the San Diego Undersea Film Exhibition (UFEX). Born in Stuttgart, Germany and raised in Chicago, Eric was educated in the Chicago Public Schools, then earned a BS in Physical Education at George Williams College, and an MS in Kinesiology at UCLA. His wife, Karen Straus, is also an active diver and underwater photographer. They live in San Diego. Phil Scott with his medal-winning swimmers. Photo courtesy of Phil and Doris Scott. Phil Scott, July 29, 1931 – July 16, 2015, from the San Pedro YMCA was called “the father of the circle pattern” by Peter Daland, Head Coach of the Los Angeles Athletic Club and USC. He said to make it work he put kids in fast to slow lanes, and each swimmer was placed in order of their speed. “You had to be quick or someone would flip turn on you,” he said. Phil’s San Pedro YMCA teams won 230 trophies and set 92 national records in every age division throughout his years as coach. Phil graduated high school and wanted to become an artist. But, after surviving the Great Depression he said, “I grew up in poverty, so I didn’t want more of it.” He applied to be a lifeguard at the Gaffey public pool and was told he was too young at 17. Instead, they asked if he knew how to teach swim lessons. “I said yes, even though I’d never taught swimming,” Phil said. “I caught on. I discovered I really enjoyed teaching—it was my bag. I was better than the other instructors because I was well organized and I kept them moving.” Teaching swim lessons led him to a teaching career of more than 30 years. He taught mathematics, art, health and physical education at Richard Henry Dana Junior High School in San Pedro. “In 1951, I got the job at YMCA.The other coaches I knew at the time were Jim Montrella and Jerry LaBonte from the north Long Beach area YMCA. We became rival coaches. Jim Montrella was one of Jerry’s former swimmers. Jerry and I put in our 16 or 17 years and retired from coaching and we were also teachers. When Jerry retired, Jim took over his YMCA and club team. Jim went on and coached Ohio State University for many years and became head of the organization for all NCAA swimming coaches. Jim was a very successful coach. I remember a hall of fame ceremony for Peter Daland and Jim was emcee. I was best man at Jerry’s wedding, that’s my connection to both Jerry and Jim,” Phil said. Phil was the aquatics director at the San Pedro YMCA until 1968, taking two years off in 1954 to serve in the Army. According to Phil, Southern California Swimming got its start from several active parents of the Brentwood Swim Club. These parents were instrumental in local swim teams becoming part of the AAU, which then led to the LSC under USA Swimming. The other two things Phil incorporated into his practice were medicine balls and push-ups out of the pool. Coach Phil Scott showed me photos from the ‘50s and ‘60s and recalled names of his swimmers and their personal stories. He was involved in his swimmers’ lives and said he was demanding and strict, but never mean. “High ideals and morals were as important to teach as swimming,” he said. You can read more about Phil Scott’s life from the San Pedro Daily Breeze obituary. The San Pedro Branch of the Los Angeles Public Library named a meeting room in memory of Phil Scott. He and his wife volunteered weekly for more than 20 years with the Friends of the Library. Bonnie Adair, head coach of Loyola Marymount University’s women’s swimming team, described her early days of swimming as just plain fun. Her family’s involvement began at the Beverly Hilton when her mom attended a show of little kids going off the diving boards. The coach was Nick Rodionoff, and her sister, Jerrie Sue, who was two and a half years older, joined the team. Bonnie was five years old and too young. She said that after a month of watching practice, Rodionoff allowed her in the water, too. Bonnie’s swim career began in 1958 and she retired in 1972. During those years she accumulated 35 age group records and her 50m freestyle record she broke as an 8-year-old stood for 29 years. She’s noticed many changes to the sport from the years when she swam with “the Puddle Jumpers” coached by Rodionoff, who is the head coach at Pepperdine. They didn’t have permanent water and her coach packed his 15 swimmers and divers into his camper and they swam at various pools. “He’d drive us one day to the LA Athletic Club, or we’d go to the Holiday Athletic Club. Eventually, one of the swim dad’s who was a developer got a pool built in the Encino, Van Nuys area. We became the San Fernando Valley Athletic Club,” she said. Bonnie described her age group team as a “little homegrown team which became her parents’ social life. All my parents’ good friends were swim families. Everyone knew each other. My dad started as a timer and my mom worked at the desk where everything was done manually off little slips of paper before we had timing systems.” Her dad became meet manager and eventually became president of the Southern Pacific Association of the AAU, which was the predecessor to Southern California Swimming. She remembered coaches association meetings in her living room in Woodland Hills. She said all the iconic coaches were there including Peter Daland, Don Gambril and Jim Montrella, who would have been around 19 years old. “I remember being afraid of Jim Montrella because he had this big booming voice, and then years later, I swam for him,” Bonnie said. Bonnie and her sister in bottom right photo, Junior Swimmer and Swimming World, October 1962. Back in those days, Bonnie said big meets were held at Santa Monica City College outside, or El Segundo Junior College in an indoor pool and the National level meets were held at the Swim Stadium, home of the 1932 Olympics. Orange County and the great pools there today, didn’t exist. She said Lakewood held the Junior Olympics in their pool every year. Eventually, all the big meets were moved to Belmont. In the valley, she said there wasn’t land to build 50-meter pools and be able to train Olympic caliber athletes. So, in the Los Angeles area, small teams didn’t have the room to grow. The growth took place in Orange Country with the abundance of cheaper land and 50-meter pools. She mentioned that Don Gambril’s Rosemead team merged with Daland’s group. They took over Belmont Pool and the team was called Phillips 66. Top swimmers included Gary Hall, Tim Shaw, and the Furniss boys. Mission Viejo came into being in the 1970s. Everyone flocked there. Mark Schubert, was a young guy who was hired. A couple of teams disbanded and swimmers like Shirley Babashoff went to Schubert. Her freshman year of college was pre-Title IX, and there were limited opportunities and college programs for women. She was training with Montrella for the ’72 Olympic Trials and didn’t want to change up her training regime, so her freshman year she was a commuter at UC Irvine and lived at home with her parents. She said during those days she swam 11 practices a week and lifted weights. Bonnie attended UCLA her sophomore year and said she was burned out from swimming. Eventually, she found her way back on deck as an assistant coach, while earning her degree. Along with coaching at LMU, she began a Masters team with Olympian Clay Evans, Santa Monica Masters Swim Team, which later became SCAQ – now the largest Masters program in the United States with over 900 active members. Bonnie Adair and Clay Evans, founders of SCAQ Masters. “During her own 13-year swimming career, Adair set 35 National Age Group records including a 50m freestyle record that stood for 29 years. Competing in 12 National Championships (her first at age 13) and two Olympic Trials, Adair became a National finalist in the 100 free and 100 fly and a member of a 400-meter medley relay that established four American records. She attended UCLA as an undergraduate and then Loyola Law School. During law school, Adair was the assistant coach of the UCLA women’s swim team and also coached the Team Santa Monica age group team. In 1979, Adair created the Santa Monica Masters Swim Team, which later became SCAQ – now the largest Masters program in the United States with over 900 active members. In her 30-plus years coaching, it is estimated that Adair has coached or instructed more than 20,000 Los Angeles-area swimmers. Between 1985 and 1994, Adair came out of swimming retirement to compete in several Masters National Championships and World Games and set national and world records in the freestyle sprint events and 100 and 200 IMs. She has contributed swimming articles to SWIM Magazine and Fitness Swimmer Magazine and was honored as the United States Masters Coach of the Year in 1997. From 1996-1999, Adair was the head coach of the men’s and women’s swimming teams at Santa Monica College, where she earned the Western State Conference Women’s Coach of the Year award in 1997. In 1998, her women’s team tied for the conference title and placed sixth in the state. Her men’s team also earned a sixth place finish. Chuck Riggs was a busy and athletic kid in Wichita, Kansas who played a number of sports including football, basketball, baseball, track and gymnastics. When Chuck was a sophomore in high school, his football coach was also the swim and dive coach. Chuck was messing around with diving and the coach asked him to join the team. Chuck then earned 7th in the Kansas State Diving Championships. His senior year of high school, Chuck’s family moved to Rubidoux, CA. There wasn’t diving there, so he went to Riverside City College and was allowed to train with Tony Turner as his coach. In 1972, Chuck worked as an assistant coach at Riverside Aquatics and said they had 11 kids go to Olympic Trials. They had a solid program and earned third place at Nationals. In Pennsylvania at a Junior Nationals/Nationals meet, Chuck suddenly found himself in charge of the team. The head coach had family issues and he left a note under Chuck’s hotel room door that the team was his. Chuck said he looked to more experienced coaches to improve his coaching skills. “Pasadena had great swimmers. There were so many good coaches and they all helped me. I didn’t know what to do to help the kids at the beginning, but after a year or so, I got up to speed,” Chuck said. Coaches who were the most influential to him included Ron Ballatore, UCLA, Flip Darr, Yale and Peter Daland from the Los Angeles Athletic Association and USC. According to Chuck, he often watched coaches at big meets. They all sat around afterward and he listened carefully to them. “I learned lots and asked lots of questions.” An example would be in Germany in 1975 World Aquatic Championships where Chuck learned from Santa Clara, UCLA and Stanford legendary coach George Haines. “Sippy always swam best times and she could swim fast anytime. If she was rested, she swam fast. If she had no rest at practice, it didn’t matter, she always swam fast,” Chuck said. 1984 OLYMPIC GAMES: silver (200m freestyle); 7 WORLD RECORDS: (freestyle); 1978 WORLD CHAMPIONSHIPS: gold (200m freestyle, 4x100m freestyle relay, 4x100m medley relay), silver (400m and 800m freestyle); 1979 PAN AMERICAN GAMES: gold (100m, 200m, 400m freestyle, 4x100m freestyle relay, 4x100m medley relay); 1983 PAN AMERICAN GAMES: gold (200m freestyle), silver (400m freestyle); 18 U.S. NATIONAL CHAMPIONSHIPS (freestyle, butterfly, individual medley, relays); 18 AMERICAN RECORDS. Here’s a link to a story about Sippy Woodhead from the Riverside Aquatics Swim Team’s website. After a divorce in 1980, Chuck resigned from coaching at RAA. “I continued to coach at Rubidoux High School. I started in administration at Redlands Swim Club. In 1982 they asked me if I could coach. We switched the team name to RST. In 1988, he remarried to Joan. In 1982 Riggs moved to Redlands, where he coached at Redlands High School for 28 years. He also taught history, philosophy and English. Riggs became the only coach in swimming history to ever coach two high school men to sub 20-second 50-yard freestyles—Karl Krug and Joey Hale. The Redlands powerhouse team also won a National Championship in 2008. Karl Krug, Mike Perry, Tyler Harp, and Joey Hale of Redlands Swim Team set a National Age Group Record in the 200 Free Relay, Boys 17-18 Division, with a time of 1:21.94. Chuck said he had lots of good swimmers. The team was a powerhouse and made top five at Junior Nationals. Chuck Riggs with his NAG record-breaking relay team in 2008. After leaving Redlands Swim Team, Chuck briefly retired, but his love of coaching never left. He returned to coaching at the University of Hawaii, where he had a second home. He says his coaching career has come full circle the past several years, where he returned to the Inland Empire coaching for Beaumont High School. In 2016, he earned the title of Coach of the Year from the Press Enterprise for his D4 girls 2nd place finish at CIF. He has returned to club coaching as well with PASS Stingrays. If you want to find out about the history of swimming in Southern California and how we became a powerhouse, go no further than Jim Montrella. A swim coach from the age of 17 at Lakewood Aquatics, to NCAA winning Ohio State Women’s Swimming and US Olympic coach, Montrella has a wealth of knowledge and love of the sport to share. Read more about his swimming accomplishment on his ASCA bio here. I spoke with Jim for several hours, covering many topics from his early days as a coach, how USA Swimming began, his introduction and production of swim paddles, to the history behind several teams and the SCS Travel Fund. “Prior to 1980, a significant number of coaches in a number of sport disciplines were becoming disenchanted with the Amateur Athletic Union because a lot of money was going to track and field and not to the other sports. There were a lot of us that were interviewed in Washington DC by a couple of senators and their staffs. They asked what can we do to help you with your sport? That was early 1970s. “An outgrowth of that became actually a breakup of the union into separate sports federations such as United States Volleyball Association, United States SwimmingUnited States Soccer, USA Soccer and USA Swimming. Early on, in the days of the AAU, the YMCAs were very powerful, Montrella said. He mentioned the YMCAs in the southern part of Los Angeles County, such as San Pedro and Long Beach. “I really never got any experience until high school and started on a swim team in my junior year in high school. I was very late to the sport in today’s standards,” Montrella said. “About two years later, Lakewood YMCA, who I was associated with, built a pool and asked me to be the aquatics director. We started lessons and started up a swim team. “There were some private swim schools back then and the Los Angeles Athletic Club and the Pacific Coast Club were very significant. From the swim schools that started teams, and the YMCA league in Southern California, which was very active, many more clubs started. The most significant club team and coach had to be Peter Daland at the LA Athletic Club. Peter came from Yale and was assistant coach back under Bob Kippeth. He came out from there to be coach at the LA Athletic Club. He was approached by USC to be the head men’s coach of the program. He coached there until the early 90s. He did a spectacular job. “We got pretty strong at the Lakewood aquatics club. We actually won the Junior Olympics for 18 years—the local one. Through the efforts of Jerry LaBonte and myself and all our staff members, we were very involved we held the local long course JOs for the local swim committee. Back then it was called Southern Pacific Association Amateur Athletic Union and it was part of AAU. We held those at Lakewood Mayfair Park swimming pool for a couple years. Then Lakewood Aquatic Club ran the Southern Cal Junior Olympics at the Belmont Pool. “The LSC goes as far north as San Luis Obispo and as far south as Camp Pendleton. And as far east as Las Vegas,” Montrella said. “Jim Sterkel, the father of Jill Sterkel, Olympian, medal winner in the 1976 4×100 relay. Her father was treasurer for SCS, which was at that time still Southern Pacific Athletic Association. He contributed a huge amount. We made a donation to what we began to call the permanent travel fund. The permanent travel fund was perceived as an endowment. And as donations came into the permanent travel fund it grew. It was permanent because we never touched the principal. However, Jim through his efforts, established a 5 cent fee for each event, with the fee to go to the permanent travel fund. That 5 cents for every event, for every child for every meet, began to grow significantly. Unfortunately or fortunately, depending on your point of view, Jim took all those 5 cent fees and swept it into the travel fund. The fund grew and grew under Jim’s leadership along with another person, Brett Borisoff. His sons were swimmers and he was chairman of swimming in Southern California for a number of years. “Fifty percent of the interest went into the current fund, the other 50% plus the five cents went into the permanent fund. The current travel fund went to defray expenses to those kids who qualified to go to the national senior meets. Let’s say your daughter qualified for the senior national meet. As you know it costs a fortune for transportation, food, housing, and a lot of people couldn’t afford it. Some of the best swimmers from Southern California couldn’t go and couldn’t represent us at Nationals, which was a shame. “It was kind of like the Olympics right now. We only can take two people in each event to represent us. But we have eight others that would have been in the consolation finals at least. “As the current travel fund grew, we decided that we would split that fund between short course nationals and long course nationals. Then the kids got their share of the money divided by the number of kids of whatever money was available. As you might guess, the permanent fund grew, as did the current travel fund and over a period of years got more and more money to defray expenses. That helped a lot of clubs that didn’t have the money to help defray the expenses. “Mission Viejo Company developed 32 square miles. Mission Viejo decided they had to relate to families so they set aside land for fields, tennis courts and swimming pools. They developed the pool and in its day it was second to none. It’s still a beautiful facility. But, unfortunately we will never host another national championship there unless we get two 50 meter pools. The Mission Viejo Co. realized that in order to sell homes, they made it very family oriented. They also developed the mall. It’s now the Shops at Mission Viejo. With the mall and auto row, hospital, etc. we have huge tax dollars which help. This allows a lot youth and senior programs. The city council was great at following the company’s mission. And it’s great for small business. There are a lot of small businesses in Mission. “A lot of us left club coaching. We had brought it from a volunteer type of status, and we evolved it to more of a professional coaching status. Now there are a lot of professional club coaches. “A lot of us went on to become college coaches. I went to Indian River and became athletic director of ten sports as well as coaching swimming. Then after two years, we went back to school I got my masters and my wife got her bachelors. We went to Ohio State and I became the head woman’s coach. “There aren’t as many club programs owned by the coach, but there should be. There’s only been less than six parent run clubs ever win a national championship. I can only remember the Cincinnati Pepsi Marlins and it was only one time when there was a merger of three different teams in 1980. I don’t think there’s ever been another one. “Coach owned teams are successful because there is a vested interest and because a professional is running the team. “Parent run organizations can be very effective and they are very helpful, but to win a national title it’s near impossible because it takes too long to get things done. “I developed some prototypes and I got some help with a gentleman name Ray Judkins, who is now deceased. He was in direct marketing sales. Ray Soft was a swim parent with two daughters who swam for me, and he had an injection molding business. I went to him and showed him the designs and prototypes. I came out with three sizes. This took about three years, from prototypes to production and I controlled everything. I bought the resins and the dyes, I contracted out to the molders, stamping, routing cuttings, packaging. There were about six guys I trusted in the country and they helped with distribution including John Gambrel and Mike Troy. “I had originally asked Speedo a few years earlier and they said no. I got the product up and running and had international distribution. “Speedo asked if I wanted to go into a joint venture. I licensed them to earn the right to exclusive distributorship. They licensed me to put their name on my product. 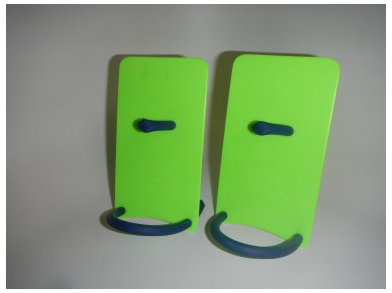 I kept my paddles on the market and when they sold more in their geographical area than I did, I would stop selling in their geographical area. It took them 14 years to take over.